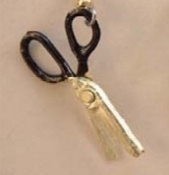 Funky Realistic Mini Black and Gold SCISSORS SHEARS PENDANT NECKLACE - DIY Scrapbook Crafts Sewing Hairdresser Tools Scissor Charm Novelty Costume Jewelry - Miniature Metal Dollhouse Sew Charms, approx. 3/4-inch (1.88cm) long, on 18-inch (45cm) Gold-tone Neck Chain with safety clasp. Great for any crafty seamstress, beautician, tailor, crafting, quilting, scrapper, artist, teacher, etc. Really OPENS and CLOSES!